May 19, 2018, 11:00am to 4:00pm, join us as we venture to Sandringham yacht club to do a fun fishing excursion on board The Boss! Fuel and skipper fee is shared. Meet other members, make new friends, exchange ideas, and most importantly, have fun! At Black rock its a great fishing spot and a place to anchor during the summer months. The sand cliffs have that fraser island appeal and iits only 60 minutes cruise from Docklands. 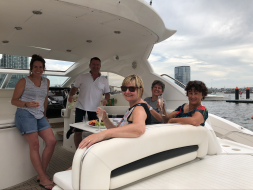 Members get to enjoy a range of boats during our social outings and there is no points charge to join the event. Drinks to follow at Sandringham Yacht Club after fishing. So come along and join the fun!